In the current market environment, investors are looking to gold ETFs as a way to diversify a traditional stock and bond portfolio. 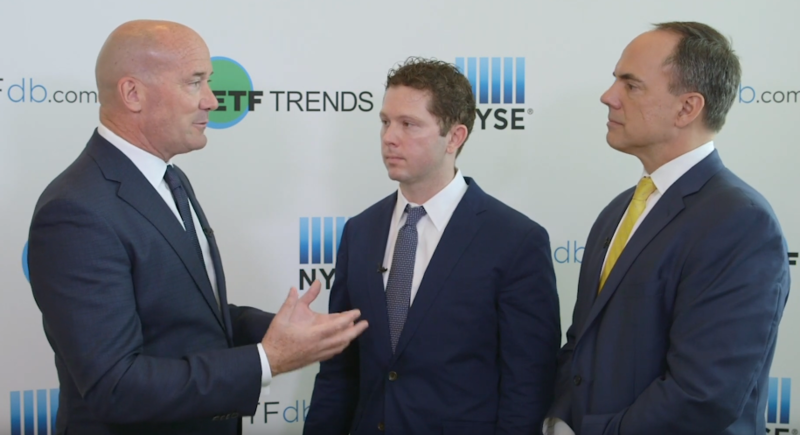 “In the fourth quarter we had a lot of great momentum in the gold backed ETF space that was driven a lot by North American flows, which tend to be more momentum driven. In January, we saw some of the same trends continue, and what’s really interesting to note is that the last time we saw assets this high, the price of gold was 20% higher,” Adam Perlaky, Manager of Investment Research for the World Gold Council, said at Inside ETFs. Fundamentals have also been supporting the gold story as increased demand in times of heightened volatility and supply constraints help support gold prices. For example, Perlaky highlighted the increased central bank demand. “So people think gold; they tend to think jewelry. That’s now only about half of the market,” said Matt Mark, Director – Asset Owner Distribution, World Gold Council, pointing to other areas of the market like industrial applications, while small, are also one of the fastest growing areas of the gold market. ETF investors who are interested in accessing the gold markets now have a number of options to choose from. For example, the SPDR Gold Shares (NYSEArca: GLD), the most liquid and largest physically backed gold-related ETF on the market, has been the go-to ETF option for gold exposure. Investors have looked to GLD as a quick and easy way to gain exposure to gold price movements as they hedge against market risks, help protect their purchasing power in times of inflationary pressures or capitalize on increasing demand from the emerging markets with a growing middle-income class. Additionally, if the U.S. dollar strengthens, investors may still capture the potential upside in gold or hedge against potential market risks without worrying about an appreciating USD through the SPDR Long Dollar Gold Trust (NYSEArca: GLDW). The dollar-hedged gold ETF may help investors gain exposure to gold bullion price movements and limit the negative effects of potential market volatility, without worrying about a stronger U.S. dollar. “We want people to view gold as a financial asset. We want to look at its strategic nature,” Mark added.